The Family Connection: Mary Purefoy; Grandmother of Thomas Dudley, Governor of Massachusetts Bay Colony, her ancestry. Mary Purefoy; Grandmother of Thomas Dudley, Governor of Massachusetts Bay Colony, her ancestry. This is the second of my posts on the ancestry of Thomas Dudley. The research was done by F. N. Craig and published in the Register. I am not reinventing the wheel, just trying to dress it up a bit. The names of the Purefoy family can be traced pretty far back in time, all the way to the 13th century. The name was first recorded in 1260 in the Misterton, Leicestershire. The records form this time deal mostly with land, renting, selling, holding, granting, quit claiming, etc. They include words which are no longer in daily use; moiety, messuage, carucates, and advowson. I have linked these words to a page of definitions, in the event you are like me and want to know what they mean. That being said, here is what is known about the Purefoy family, ancestors of Thomas Dudley, Governor of the Massachsuetts Bay Colony. The Purefoy family lived in and around Misterton a small village on the Roman road, known as Watling Street, in the County of Leicestershire. Looking at Misterton today from Google Earth shows a patch work of farm fields in greens and browns, almost in the center of England. The River Swift runs just to it's north. Across Watling Street and slightly south is Churchover, another small farming village where the family held land. Churchover is in County Warwickshire. The family lands remained concentrated in and around the Leicestershire/Warwickshire border area. 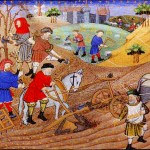 The period of time in which these people lived is known as the Late Middle Ages (1300-1500). After a period of prosperity and growth England was facing drought and famine and by 1350 their world would be decimated by the Bubonic Plague, known as the Black Death. The Purefoy's daily life was centered around two essential and intertwined calendars, the agricultural and ecclesiastical calendars that marked their year. Michaelmas, 29 September, was the feast day of St. Michael the Archangel. This day marked the beginning and ending of the husbandman's year. Many legal documents were dated using a feast day as a reference. Today we have to look up the date of the feast day on wikipedia but the medieval Purefoys were intimately acquainted with the many feast days that made up their year. William was the largest taxpayer in Churchover in 1332 and his descendants were presented to the living of Churchover until the dissolution of the monasteries. William's wife's name is unknown to us as are any children other than Philip. Also note that the name, at least as far as he is concerned was Purefoy not "de Purefoy". The 'de' was used, but back in 1277. If William of the 1329 deed was our Willliam, then he held a tenement at Misterton from Robert Napton. A tenement, using our modern definition is a run down, squaid apartment block, but in medieval times the word only referred to any abode or place of habitation. It had no reflection on the quality or desirability of the house. In the year 1201, during the reign of King John, the English government began keeping a record called the Patent Rolls. These rolls were an administrative record of appointments to commissions, grants, pardons, privileges, etc. Commissions of peace were made to men of good standing in their communities. They could investigate crimes, settle disputes, put offenders in jail and keep the peace for their county. Philip was commissioned several times for the county of Warwickshire. In 1368 Philip was commissioned, with others, to investigate the claims by the monks at the Abbey of Stoneleigh in Warwickshire, some twenty four miles from Churchover. The Abbot claimed that 'divers men' were stealing their oxen, cows, sheep, vestments, chalices and jewels. The men had ruined the woods and making it hard for the monks to survive. In 1374 Philip and his son William were witnesses in a civil case. Philip is said to have had some training in the law and was the steward to Ralph, Earl of Stafford and held his courts for him. Philip's second son was Thomas. He was trained as a lawyer and a member of the Middle Temple, one of the four Inn's of Court. He is said to have been on the council of Richard Beauchamp, Earl of Warwick, one of the most powerful men of his time. Thomas was very successful. He bought the manor of Fenny Drayton where his family lived until 1706 when a less than successful Purefoy was forced to sell the manor. William was probably born right around the time of the black plague by 1350, by the time of his maturity around 1370 the world was a very different place. The glorious reign of King Edward III was in it's final years. The Hundred Years War was well underway, the Black Prince was dead and tumultuous reign of his grandson, Richard II was about to begin. 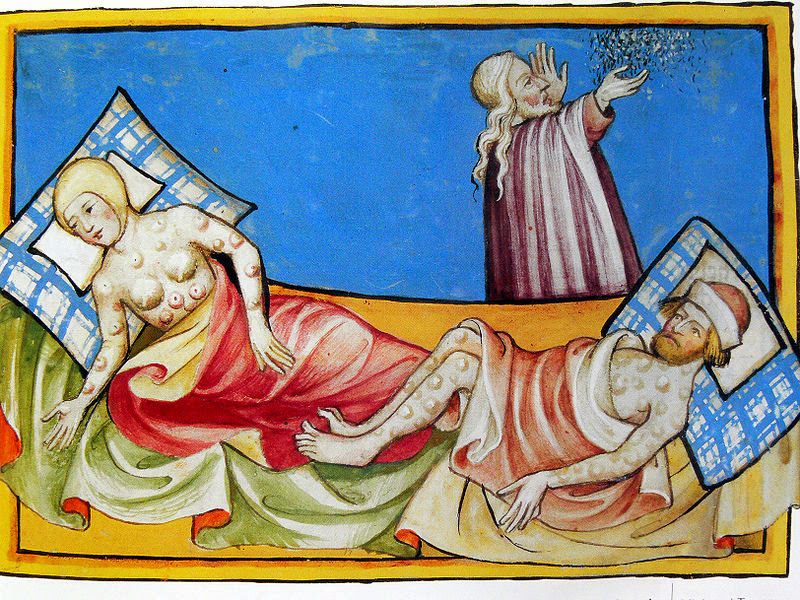 But the Black Death brought benefits to the survivors. Men married at an earlier age. Landless men could obtain the land of their brothers, cousins, neighbors or others who had died. Men could fill civil roles that had been done by others; take on new roles to improved their status. 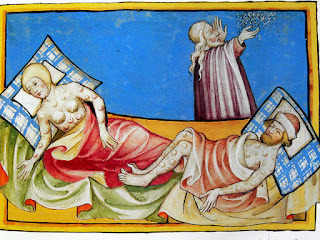 Despite the undeniable horror of the Black Death, those who survived reaped some benefit for the 'reset' of their world. William seems to have been a quite successful man. In 1385 he was granted the reversion of 12 messuages and 13 virgates of land in Cesters over and Cosford. It had been held by held by John Paraunt and Clemence his wife. His mother Margaret must have passed away by 1393 when his right to his share of the manor of Shirford in Barton Hastings was recognized. William served on multiple commissions, again in the County of Warwickshire. In 1391, according to Dugdales Warwickshire, William was granted licensed to have an oratory (private chapel) in his house at Shirford. This license was granted by Richard Scrope, teh Bishop of Coventry and Litchfield. In 1397 William's father, William 2, covenanted with Aliva, the widow of Sir William Chetwynd, that his son, another William, would marry her daughter Margaret. The covenant was drawn up on the Feast of Barthlomew in the year 21 Richard II, (24 August 1397). The wedding would occur before the feast of Exaltation of the Holy Cross, 14 September. The bride and groom would have been acquainted prior to the covenant. The dower would have been negotiated and agreed upon. Once their commitment to marriage was made known it is practically a slam dunk. The couple could even engage in you know what and were often pregnant by the time they arrived at the church door. The exchange of vows would take place outside on the church porch. The vows were almost identical to what couples say today. The wedding was followed by a feast. Then as now, on to real life. William continued to improve the families fortunes. His name is found on the Patent Rolls multiple times as he was commissioned like his father and grandfather. By 1400 life was getting a bit easier. Houses were more substantial. Roofs were made of tile or shale. The door was framed and windows were made. Houses now have two distinct rooms and some have an upstairs! The central hearth was replaced by a chimney so no more smokey fire in the middle of the room. Life was good! Based on his parents marriage, William was likely born around 1400. He was contracted in marriage at a fairly young age. by 1432 his name was entering the records. He had inherited his grandfather's land in Cester Over and shared over lordship with John Waver. In 1434 an oath was given in all the counties of England. The men taking the oath were the leading men of the county and they swore 'not to maintain peacebreakers.' William Purefoy, Esq. of Shirford was among the men of Warwickshire taking the oath. Notice the esquire attached to his name, William was a Gentleman. His name appeared on a land deed, not for him but for other men, but it is also written esquire. In 1430 the English had captured Joan of Arc and burnt her at the stake in 1431. Later that year, the English King Henry VI was crowned King of France in Paris in a lavish ceremony that caused a financial crisis in England. Trouble was always just around the corner. In 1448 William reached the height of his career and was High Sheriff of both Warwickshire and Leicestershire. The sheriff was the principal law enforcement officer in the county. His last entry into the public record was in 1455 when he stood surety (mainpernor) for Sir William Peyto of Warwickshire, who was accused of assaulting a neighbor. In a document written in 6 Edward IV (1467) Philip Purefoy son of William was 24 said to be years old. It was first believe that he could not have been the son of William and Marion Ayot, therefore he must have been the son of a William 5. It is now believed that he he was the son of William Purefoy 4 and his second wife Margery Moton. 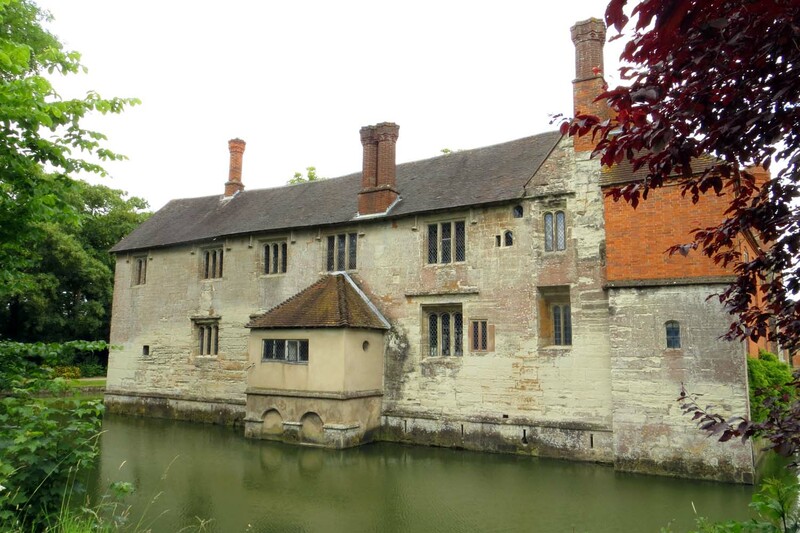 In 1464 William sold the manor of Foxcote to Thomas Waldeve. William died in 1466, the first confirmed death of a Purefoy. An IPM of his estate stated that he held no land in Warwickshire. He must have divested his estate to his sons or possible sons-in-law. William was succeeded by his eldest son Philip who was married to Isabel Brome. They had two sons who, John and Nicholas who died young. Philip died in 1468, his heir was his younger brother John. There was another brother named Henry who had also died prior to 1468.Philip was buried at the church of St. James in Baddesley Clinton in Warwickshire. In 1438 the manor of Baddeley Clinton was bought by John Brome, the Under Treasurer of England, he was the father of Isabel. Her brother Nicholas inherited the house in which he killed the parish priest. To atone for this misdeed he made extensive repairs to the parish church. Yeah! Finally a different name. John succeeded his brother Philip in 1468. This was a dangerous time in England. Edward IV (Yorkist) had taken the throne from his cousin Henry VI (Lancastrian) in 1461. Henry's wife Margaret of Anjou wanted it back. This was the War of the Roses. In 1470 Margaret and her forces over threw Edward for one year, he returned in 1471 to reclaim the throne after winning at the Battle of Tewksbury. Sir William Fielding was killed at Tewksbury fighting for King Henry. 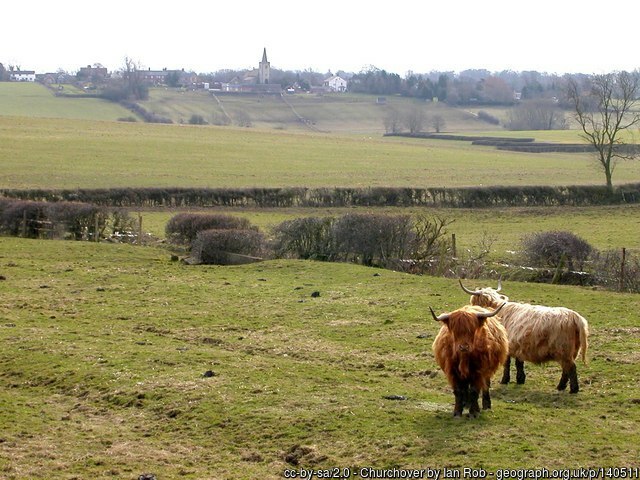 In 1485 the Battle of Bosworth at which Henry VII defeated King Richard III took place only twenty of so miles from Misterton. In 1472 John's sister in law, Isabel married John Denton. He granted to them the manor of Shirford which his family had held since early in the previous century. John died young, by 1491, leaving a son Nicholas. John's wife is unknown. Because Nicholas' father died while he was still a minor, he was given to a guardian to 'safe guard' his estate and manage it for him until he reached his majority. In 1491 Nicholas of Daventry, was made the ward of John Denton, the man who had married Isabel Purefoy. Daventry is about 16 miles to the south of Misterton. There seems to have been a master plan at work here as Nicholas married Alice Denton, the daughter of John Denton and Isabel Purefoy Denton. Thus, keeping the manor of Shirford in the family. The family was of Shalstone in Buckinghamshire thereafter. Edward born on the cusp of a new century and a new dynasty, the Tudors. The future Henry VIII was born in 1491 and would succeed his father in 1509. The golden age of England was upon them. Edward married Anne Fettiplace of Shirford. She was born on 16 July 1496. Edward died in 1558. Their daughter, Mary Purefoy, married Thomas Thorne. "Parishes: Churchover," in A History of the County of Warwick: Volume 6, Knightlow Hundred, ed. L F Salzman (London: Victoria County History, 1951), 62-64. British History Online, accessed April 27, 2016, http://www.british-history.ac.uk/vch/warks/vol6/pp62-64. F. N. Craig, Maternal Ancestry, 227-244. Great Britain, Calendar of the Patent Rolls, Edward III, Volume 16, 1374-1377 (London: The Hereford Times, 1916). "Parishes: Monks Kirby," A History of the County of Warwick: Volume 6, Knightlow Hundred, ed. L F Salzman (London: Victoria County History, 1951), 173-181. British History Online, accessed May 6, 2016, http://www.british-history.ac.uk/vch/warks/vol6/pp173-181. Francis Gies and Joseph Gies, Marriage and the Family in the Middle Ages, (New York: Harper Row, 1987) 251. William Dugdale, The Life, Diary and Correspondence of Sir William Dugdale, (London : Harding, Leopard and Co., 1827). 194. John Lodge and Mervyn Archdall, The peerage of Ireland: or, A genealogical history of the present nobility of that kingdom, Volume 1, (Dublin : James Moore, 1789) 252. William Dugdale, The antiquities of Warwickshire illustrated : from records, leiger-books, manuscripts, charters, evidences, tombes, and armes : beautified with maps, prospects, and portraictures, ( London : Thomas Warren, 1656) 37. Lodge and Archdall, The Peerage of Ireland, 252. "Parishes: Burton Hastings," A History of the County of Warwick: Volume 6, Knightlow Hundred, ed. L F Salzman (London: Victoria County History, 1951), 57-61. British History Online, accessed May 14, 2016, http://www.british-history.ac.uk/vch/warks/vol6/pp57-61. Douglas Richardson, Plantagenet Ancestry: A Study In Colonial And Medieval Families, 2nd Edition, 2011 Ancestry. page 96. My first Youtube Video, it needs a lot of work but what the heck. I thought I'd post it here anyway.